I got the full version a couple of days ago and it took me a while to customize it for the 3 stores I shop. The customized aisle feature is really useful since my shopping lists are now organized in the order in which I navigate the stores. I used it yesterday for my first high-tech shopping trip! What a great experience not having to wrestle with pen and paper and cart! I was also able to correct the aisle order right there since the original setup was based on a faulty recollection. I have questions about pick lists and favorites: there is no overlap amongst the items I buy in the 3 stores, that is, each store’s items are unique to that store. So I set up the pick lists for each store accordingly. But I also set up a list of favorite items for each store. Was this overkill? Does this explain why the drop-down list in Picks shows each store name followed by the same name prefixed with a star? Does this hurt anything? Which list should I use as the primary list for item maintenance or should I get rid of the favorites lists? This is really a minor problem that does not presently prevent me from using the app. Would still appreciate a response. Hi Prakash, thank you so much for your feedback and your question. Kindly note that you have two instances of the same store in drop-down list under Picks, one of which tailed with a star, because your stores have associated list-specific Favorites. Therefore you can choose either store or its Favorites list as destination to add items from Pick list. It’s totally normal, so you can use such configuration if it’s convenient for you. I am just getting started with this app and trying to figure out the favorites. I would like to have a favorites list for individual stores. When I click on Store B under favorites, it shows all my favorites for every other store…… any way to separate the lists? Yes, it is possible to list your favorites by store in Mighty Grocery. Please see “List-specific Favorites” in Manage shopping lists User’s Guide. 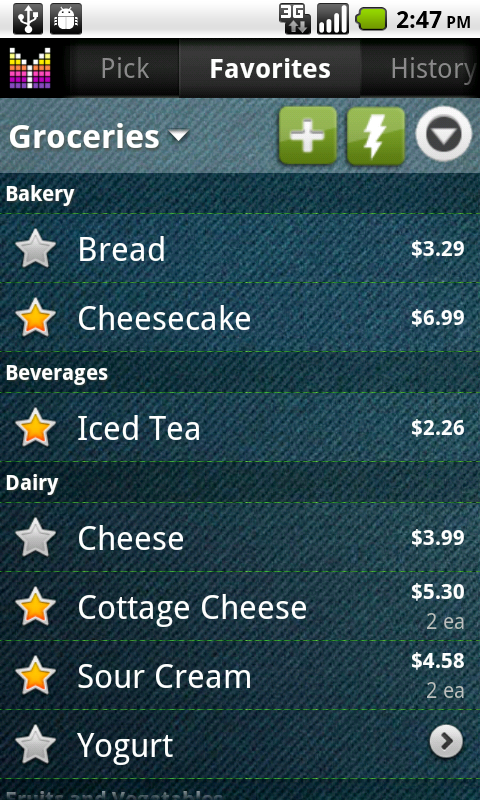 Let me just start by saying what an awesome app Mighty Grocery is. I zoom through the grocery store with ease and it’s all thanks to M.G.! One quick question: When going through my favorites and selecting items to place on my list, it used to keep my place as I starred items but now (since 1 or 2 updates ago) when selecting items from my favorite list it jumps all the way back up to the top of my favorites every single time and I have to consistently scroll back down to where I had left off. This definitely makes populating my list with favorite items take significantly longer. I have searched through the settings and cannot find a way to fix this. Is there some setting I am missing and/or is there a way to fix this issue? I am currently running the full Beta 16. Hi Rich, thank you so much for your feedback and pointing out the issue. Indeed, Favorites list will scroll up if item’s star is clicked. The fix will be introduced in the very next release. In the meantime I would recommend clicking in the middle of a row (not on a star) which should prevent Favorites list from scrolling up. Sorry for inconvenience and thanks again for letting me know about the issue. The yellow star is imho a poor choice for marking an item as already on one of the shopping lists, because in every application I know of a star is meant to mark a favorite. I was confused about what the star means before looking into these docs. I would suggest a shopping cart symbol or a plus sign. Hello, thank you for your feedback and suggestion. I mostly agree with you, so we will revisit it later this year when we introduce UI improvements along with Themes feature. First, I’d like to say “Great App”. I’ve tried several shopping list apps, only to settle on yours as my favorite. My question :How can I remove an item from favorites without deleting it from all of the other list as well? I would like to keep some items available in the “Pick” list, but remove them from favorites. Hi Sean, thank you so much for your feedback and your question. To keep items on your Pick list and safely remove them from Favorites, just move the items from “Automatic picks” category to “My picks”. To do so, just go to Settings –> Pick list –> Automatic picks –> set check next to items you want to keep –> Actions –> Move to My Picks. Then it will be safe to remove items from Favorites. Hopefully this helps. Please let me know if you need any further assistance. Is there a way to collapse the aisles in the favorites category like you can do in the pick list. Greg, thanks for your question. Unfortunately, there is no way to collapse categories in Favorites yet. We may be considering this feature if we see user’s demand. I’ve got your vote counted. Love your app! And as a household management blogger I’m excited to share what I’ve found in it. I’ve tried about 20-25 different shopping apps and yours is, by far, my favorite. I have one suggestion for now. I’d love too see a customizable favorites list for each store. There are things I buy at one store, but not another. It’s cumbersome to shift through a long list of items for one or two items I buy at one location on a weekly basis. Also, it would be awesome if the favorites list had an option to NOT retain the quantity as I rarely shop the same quantities on a week to week basis. Lastly, is it possible to merge the aisle order in the favorites list? Thank you for an awesome shopping app! Whoops, forgot something! When adding items to the favorites list it won’t pull up the customized aisles. Am I missing something? Hi Desiree, thank you so much for your feedback and I very glad to hear you like the app. 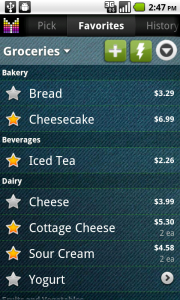 Let me start with the good news about customizable favorites as we have the feature on our plans for shopping list app. Anyway, thank you for sharing your opinion as we may adjust priorities to deliver most demanded features early on. As to not retaining quantity on favorites list, it is possible by unlinking individual favorite items (a button on top-left of Edit Item Details screen). The section “Linked and Isolated changes” on Edit Item Details User’s Guide page might be helpful as well. As to aisle order, I am not quite sure about term “merging”. Let me try to guess the answer, and if I’m wrong, you are welcome to correct me. So, as you know, aisles can be reordered and renamed. By default all shopping lists, including Favorites get the same aisle configuration. We call it “Standard configuration” and it can be observed and changed on Aisles page when “Any list” is selected on the top. However, any shopping list may have its own aisle configuration. Aisle customization is briefly explained in “Customizing aisles per shopping lists” section of Aisles User’s Guide. To summarize, you may individually customize aisles for Favorites or you may use standard aisle configuration named “Any list”. Looking forward to further questions if the above explanation was not sufficient. Thank you for replying. For the most part I either figured out on my own with just playing around or by your clarifications above. Regarding merging, to clarify, when I for to the Fred Meyer list and pull up favorites to add to my list the favorites list is listed by the default aisle configuration, not the customized store configuration. Is there any way to make those two the same by store? And also have favorites only listed by a certain store instead of a master fave list? Desiree, thank you for clarification. I guess I see now. Unfortunately, currently there is no way to do that. However, it will be possible to pull aisle configuration from selected shopping list as well as have favorites listed by that list when we have “Favorites by list” feature implemented. Thank you for your feedback and looking forward to your further comments. In reply to the following question, I suspect that you have customized aisles for Favorites list but changes are made to “Any list” configuration. To check this out, open Aisles page, select Favorites in the top selector, and have a look at the message. It would read either “This list has the standard aisle configuration” or “Aisles for this list are customized”. To sum up, you may want either to make changes for that specific customization of Favorites or to Reset customization for Favorites list so that Favorites would use the standard aisle configuration. Your further questions are welcome. My prices are in my favorites list, but not in my grocery list…they all went away when I checked out…how do I put them back without manually entering each one? LOVE the app otherwise…my father put it on his homescreen. Barbara, thanks for the question. I am not quite sure I got your question correctly, so I will give my best guess answer and you are welcome to provide more details if my guess was wrong. As you checkout from grocery list, all items are moved to history. Price is saved in history and in favorites for matching items. So next time when you go to favorites and click an item with price, it will get added to grocery list with price. You may also want to go to history and add items from there. Price will get restored as well. I hope this was helpful. If not, don’t hesitate to write back. Is there a way to delete an individual item (not everything)) from the favorites? Sure, as with lists — long-pressing the item will bring a context menu with Delete option. This is what you are looking for.